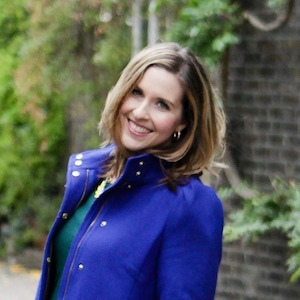 It’s my birthday week, so I knew I had to make this week’s blog posts extra special. I started off with a post about a trip to San Francisco that just got me more excited to return back to the city. And when it came to my food post, all I wanted was to whip up something that A) makes me happy and B) reminds me of Summer. And that’s where this Pimms cocktail comes into play. In case you didn’t know, if I don’t mention it enough, I adore London. It was my home for a short time one Summer and then again for a year when I attended graduate school there. And even though grad school was stressful as hell, I wouldn’t have wanted to be stressed anywhere else! Now like any proper Englishman, pubs are a part of your life in the UK. Everywhere you look there is a pub . . . or 4! 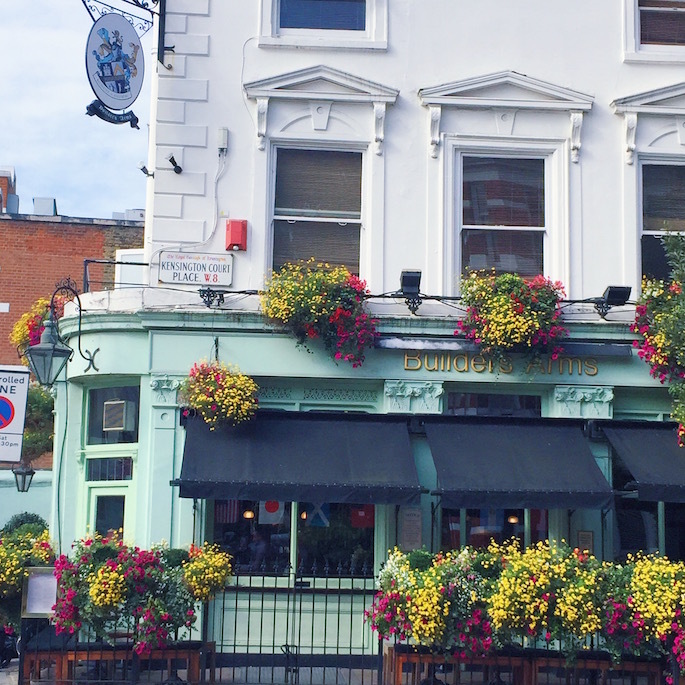 One of your first goals when arriving in your UK neighborhood is finding “your pub”. For me, our pub was Builders Arms in Kensington. It was a stone’s throw from school and my dorm, and was a chic spot with cozy couches, great lighting, seating outside, and a culinary school next door meant the food was sure to be more than your average pub grub. Here’s my neighborhood pub, Builders Arms. So many fond memories there! 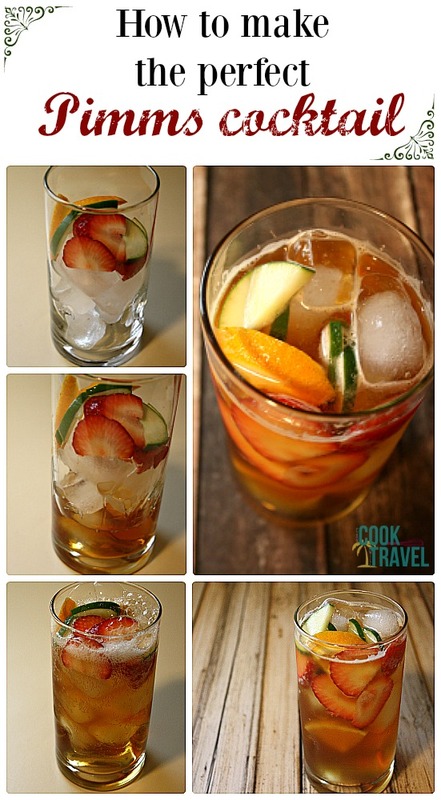 And one of my FAVORITE drinks to get (at any pub) especially in the Spring and Summer was a Pimms and Lemonade. Pimms is an English-made gin liquor, in case you’re curious. Now for those of us in the States, “lemonade” is what the Brits call a lemon-lime soda. And my Pimms and Lemonade would come filled with cucumbers and oranges and was so damn light and refreshing that it could quickly have me forgetting how stressed I was and instead breathe in the fruity flavors and feel like I was on vacation. When my sister and I went back to London last Fall, the first drink I had at the pub we found in Russel Square was Pimms! I was officially home. This time, in our lovely Pimms pitcher, I noticed strawberries! What are those doing there?! Well by the time the pitcher was empty, I was happily a fan of this addition! Ginger Ale – I went with a diet ginger ale to avoid the sugar-y alternative and to go a step up from lemon-lime soda, because I’ve tried to cut out soda (or pop as we say in the Midwest!) in the past year and am glad I have. Fruit of choice: My go-to’s and what I highly recommend you try are (and will always be) cucumbers, oranges, and strawberries. Fresh mint is optional. If you have some that is gorgeous and in season, then throw some of that in your glass or pitcher! The Pimms recipe you’ll find here is for a single glass, but feel free to increase the amounts and make a couple of pitchers for your next BBQ or party. 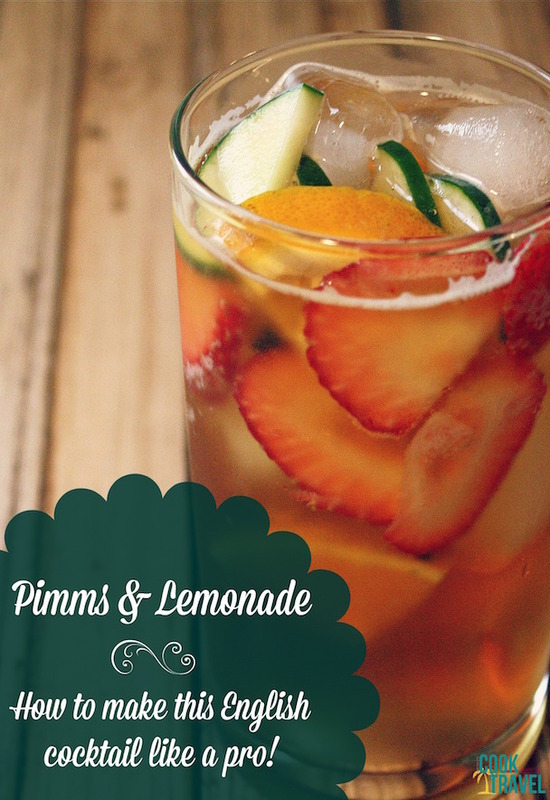 Before you know it, all of your guests will soon be huge Pimms fans too! A note on the Pimms: It’s not something that every liquor store will carry in the States. But you can always go to a large liquor store and ask and if they don’t have it, they can order it for you. I also found it this week at my local World Market store, because they’re awesome! And I love it so much that I am rather stingy with my Pimms. In fact, I’m only now finishing up a bottle that my sister tracked down for me years and years ago. So I can attest that it will last you a long while. 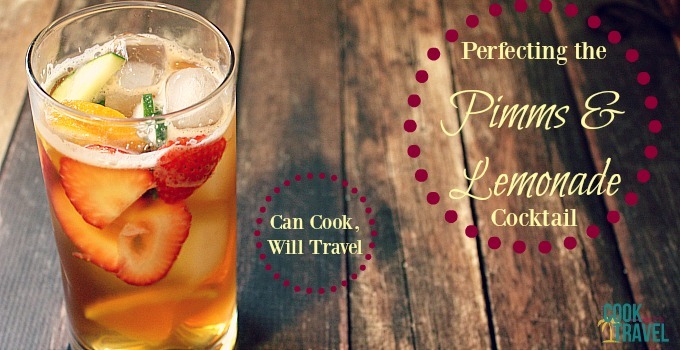 If you want a refreshing Spring or Summer drink, then this Pimms drink recipe is a must. As I write this post with my Pimms in hand I’m transported back to my neighborhood pub with each sip. Everything about this drink takes me back to a time when I started to become the woman I am today who loves an adventure, a challenge, and a good pub! Cheers, love! One year ago: Beer Cheese Dip is Mmm, Mmm Good!